So this is my first ever roast. I mean, I have roasted a chicken and all, but never a big roast like this. Mom always does the Turkey at Thanksgiving and really, that is the only roast my family does. Until now, because I decided I needed to make a roast. It’s just seemed so Christmassy and perfect. Every Christmas Eve, my family usually grills a beef tenderloin. It’s tradition, we do it ever year. This year though, I am taking over and making prime rib. This cut of meat was pretty amazing and this is coming from a person who really doesn’t care much for meat. And oh my gosh, it’s so crazy easy to prepare. Which clearly means it’s perfect for holiday cooking and entertaining. And speaking of holiday entertaining and the holidays. I spent all day Saturday trying to make a Christmas Croquembouche and let’s just say it ended in tears and not the happy kind. Making the cream puffs was easy, piping them with my chocolate pastry cream was easy, forming them into a pretty tower was when things went bad. And then things went from bad to worse when I had to make the caramel. Things got absolutely disastrous when I tried to spin sugar around my pathetic looking tower. Who the heck do I think I am trying to spin sugar? I mean, I have zero training in baking, and spinning hot sugar is just not something I should be attempting. I completely ruined a bowl, like to the point where the hot sugar actually cracked it (thank goodness it wasn’t anything great) and the fork I was using ended up in the trash too because getting the hardened sugar off just seemed like a miserable option. SO… you guys will probably never see a croquembouche recipe from me. I am still mentally and physically exhausted from the day. I tried so hard (SO HARD think sun up till sun down) to make it work. I had this picture in my head of how I wanted this pretty Christmas tree shaped dessert to look, but it was just not happening. The good news is, everything was edible and tasted delicious. BUT instead of a pretty tower, it looked like I plopped a bunch of cream puffs on a plate, smooshed them together and then tried to drizzle them with a caramel that got way too hard. Luckily, I nailed this coffee rubbed prime rib roast and topped it with the most insanely good butter. It’s pretty simple so I think the only way you can mess it up is if you overcook it, which even then I have read that this cut of meat is still juicy when slightly over cooked. Good. Room for mistakes because mistakes happen. Especially during the holidays. The seasoning rub is basically all things Christmas. There is brown sugar, coffee, smoked paprika, chili powder, ginger and even some vanilla beans. It’s a tad odd I will admit, but in this case odd is so very good. It’s simple and delicious. However, if you are not feeling all the seasonings, you really just need coffee, salt and pepper. This cut of meat will be good with three simple ingredients. Do whatever you prefer (but you really should try my rub because it’s so good!). Also, you can prep the meat (putting on the rub and all) a day in advance, just let it sit in the fridge overnight and then take it out of the fridge at least an hour before cooking to allow the meat to come to room temperature. Oh, and most importantly? The gorgonzola butter. You have to make this. Steak, butter, roasted garlic and cheese, it’s the most award-winning combo. 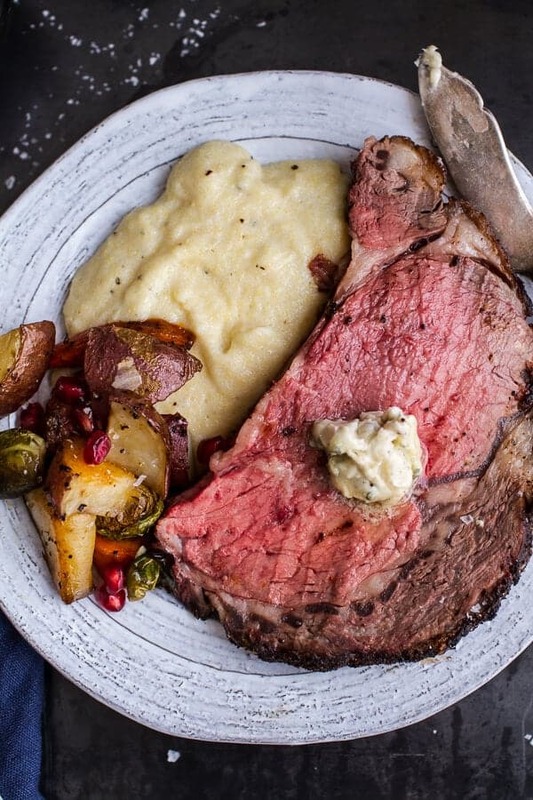 If I am being honest, the roast is delicious, but the gorgonzola butter – it’s what makes this roast out of this world and perfect for Christmas Eve. So bottom line? If you make this roast, you must make the butter. Butter for life. Is anyone else getting excited for Christmas week? I surely am….freaking out a little too. Family friends will be here Thursday through Saturday and then the family starts arriving Saturday. Too much to do, not sure where I will be living, anxious, stressed and excited all at the same time. So basically I am a ball of emotions. But hey, at least I’ve got the food all planned. That’s the most important thing. Gotta have good food at Christmas! And oh my gosh, it's so crazy easy to prepare. Which clearly means it's perfect for holiday cooking and entertaining. In a bowl, combine the coffee grounds, brown sugar, smoked paprika, chili powder, ginger, vanilla bean seeds, salt and black pepper. Rub spice mixture all over the beef, coating evenly. Add the chopped root vegetables, onion and garlic to a roasting pan. Place beef on top of the vegetables and allow it to come to room temperature. Ether leave on the counter for 30 minutes, or refrigerate covered, overnight or up to 1 day. About 3 hours before you plan to cook the beef, remove it from the refrigerator. *I had my butcher remove the bones and then tie them back on for added flavor. I think this is the best way and you get the best flavor. Side note – my brothers are all dying right now because they somehow missed out on this meal. Hooooollly crap! This looks beyond fantastic! I would have loved to see your Croquembouche but I totally understand epic failures. I’ve had a lot recently, i.e. my chestnut flour macroons totally did not happen and then even something as simple as pumpkin cinnamon rolls, total fail! I am so intrigued by your rub and all those flavors. It sounds amazing! Oh, and that gorgonzola butter, Yes!!! Fails are the worst and never fun…ugh. I usually eat chicken but I’ll take a big old piece of this meat it looks good. You make things on plates look wonderful even cream puffs. I have a grand baby due Dec. 19th and will be heading to Seattle when he arrives to help out for a week or so. 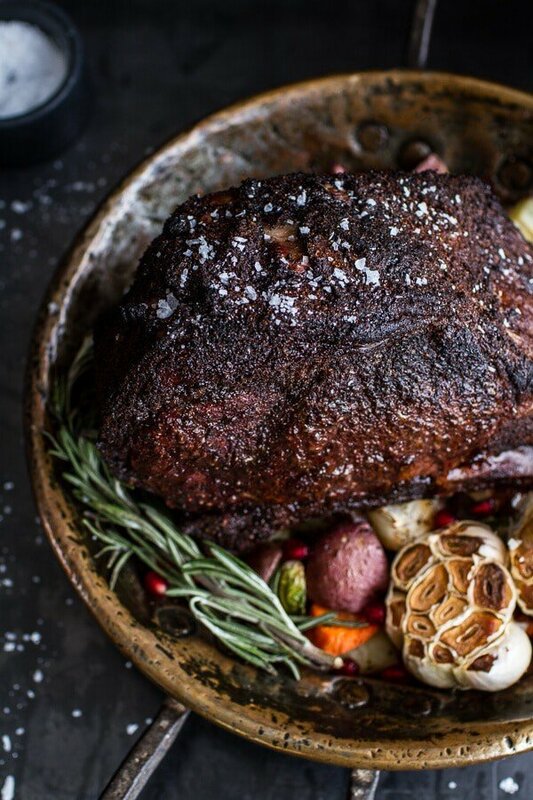 This will be Christmas dinner, Tieghan; elegant and delicious but SIMPLE! Hats off to you for your wonderful ideas and delicious flavors. A very Merry Christmas to you and your houseful of lucky guests! THANK YOU! And congrats! How exciting! Wishing you and your family a very merry Christmas! 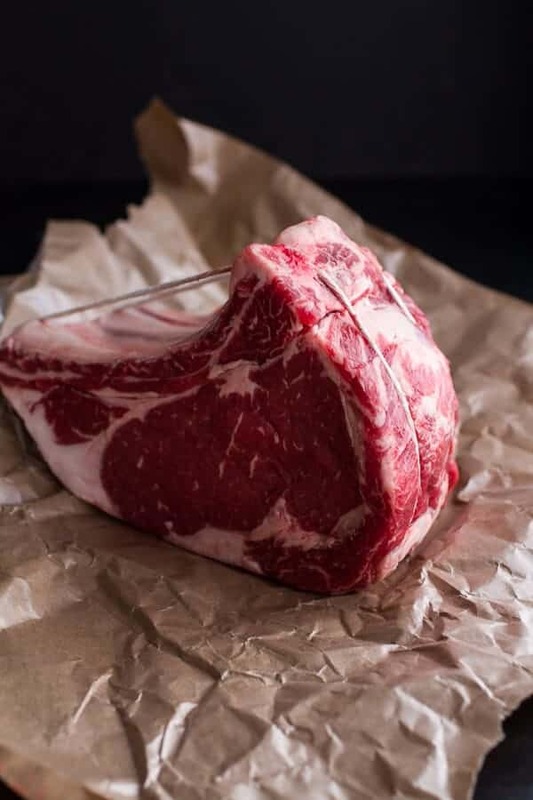 I have been wanting to make prime rib for years and haven’t because I’m afraid to mess it up and lets face it..it’s not a cheap cut of meat..but you make it look easy so I’m going to give it a try this year…and I’m definitely making that butter. 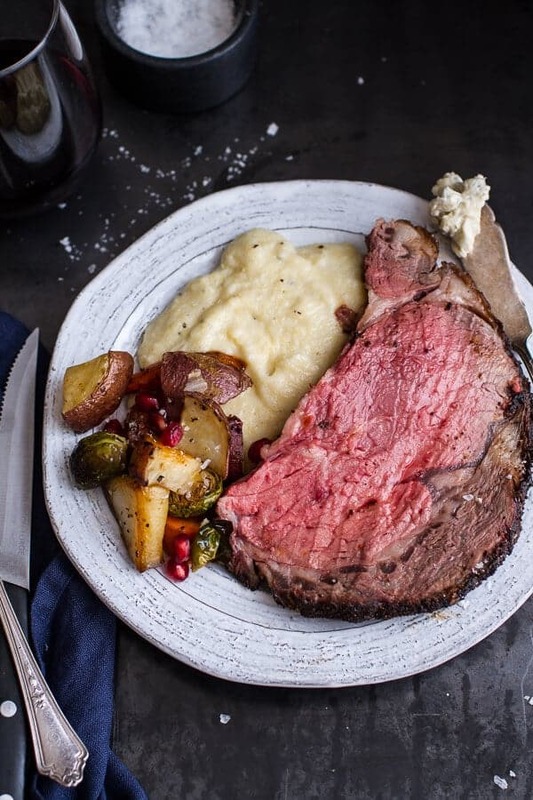 You can totally make a prime rib. It’s pricy, but worth it for Christmas! I can definitely get down with this Gorgonzola butter! Looks so good! Don’t you HATE when a recipe doesn’t go your perfect idea way? I turn into a 5 year old and pout and cry. AND this prime rib! HOLY gorgeous! 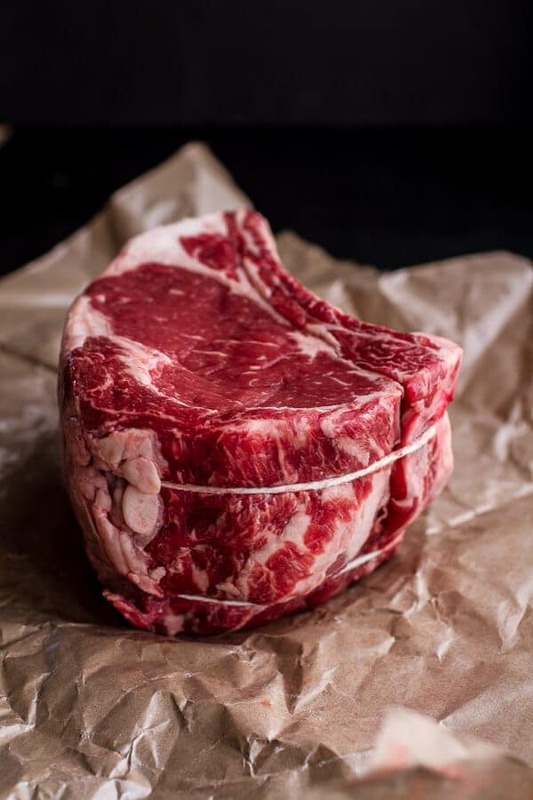 I happen to ADORE coffee on beef….so I am all over this beauty! Pinned! What an amazing colour! I love the beef/coffee flavour combination but I still have to give it a try at home. Now that I’ve seen this recipe, I’m really looking forward to give it a try. I’m sorry your croquembouche didn’t work out, but next time no need to throw out any utensil with hardened sugar on it. Just throw it in a bowl of cold water and in 10 -15 minutes it melts right off. Same with burnt or hardened caramel in pots. Fill it with cold water and voila, it’s gone in minutes. Love the roast! Thank you for the tip, I cannot wait to try that! oops, change that to warm water! I think I need more sleep! I have never made a roast either! But I am swooning over this. The gorgonzola butter alone is making me want this right meow! This looks like perfection, and I have been really liking your pictures lately. The dark backgrounds that you have been trying really accentuate the beauty of your masterpieces! 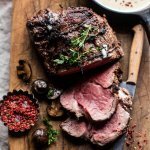 I’m not much of a roast fan either Tieghan, but these pictures have my drooling over here – especially the garlic gorgonzola butter! Sounds like your holidays will be good crazy! Can’t wait to hear all about them! Oh my heavens….spinning sugar – you have guts, gal! 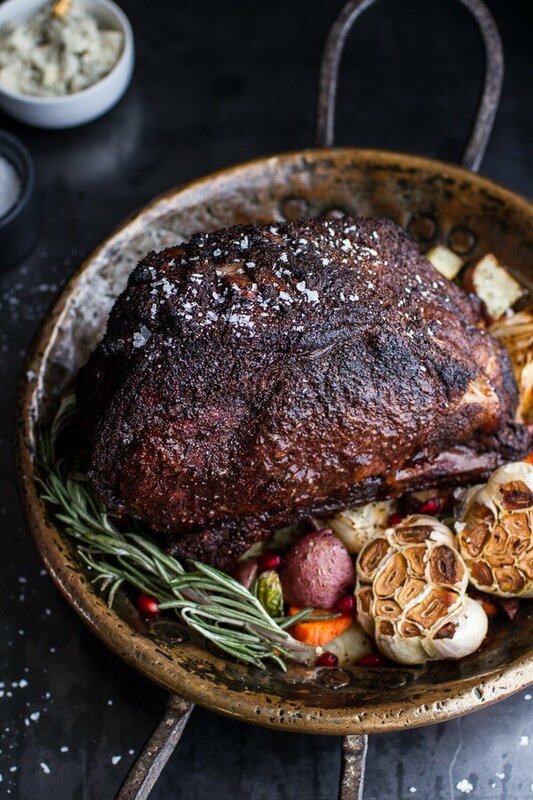 And this roast…whoa! Not sure I can make a roast for just myself (well I could but I shouldnt…) That rub sounds rather versatile and would be great on ribs…yes, I just said I shouldn’t make a roast for just myself, however a full rack of ribs – why the hell not! I cried a little inside during your croquembouche story. Working super hard to make something beautiful and not having it turn out is pretty heart breaking 🙁 But, on the bright-side, this roast looks perfect! Seriously screams Christmas dinner! LOL!! I seriously can’t believe we both post coffee-rubbed prime rib on the same day!! Great minds think alike. And that buttah….dying!!! Gimme dat BEEF! In spite of the fact that I can ea pounds of it, I’ve never made prime rib, and you definitely did nail it. Welp, I’m inspired – time to roast a hunk o’ beef and shmear it with gorgonzola butter!! I don’t even eat meat and that looks good! Please do a post (with pictures) on the barn soon!! Your first ever roast?! You nailed it – and I thank you for that because now I know what I’m making for Christmas dinner! 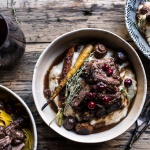 I’ve never tackled a beef roast, but this definitely makes me want to try! In the meantime, I have to at least make that gorgonzola butter!! 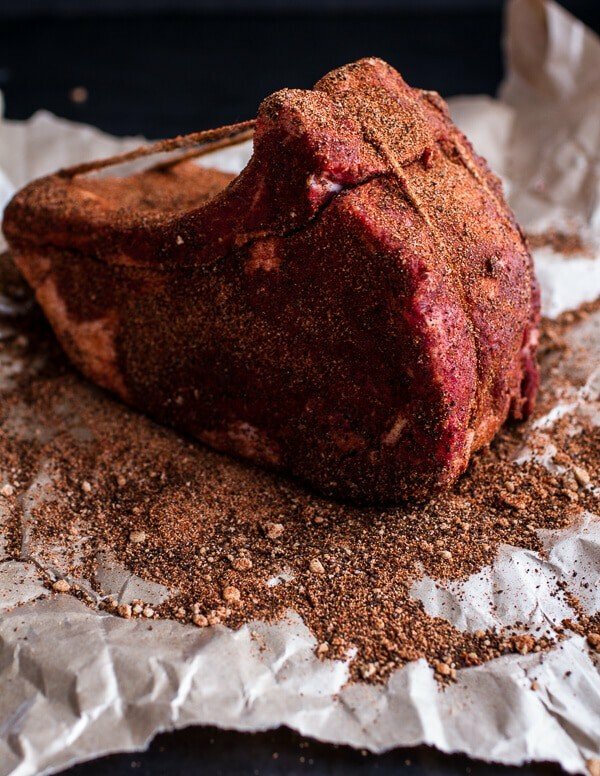 Coffee rubs are the absolute best, I love this roast! So sorry about the croquembouche – I’ve never attempted to make spun sugar but I have a feeling things wouldn’t go much better for me either! UGH. It’s the worst right? Sorry yours didn’t turn out either! 99% of all “Prime Rib” recipes fail in that the cut is only PRIME rib if it comes from PRIME graded beef. Otherwise, it is a STANDING rib roast.which is nearly as good as prime, but cost’s a heck of a lot less. The use of the word “PRIME” is to grab attention and $$$ from the unknowing and unsuspecting. Just wow, Tieghan! Beautiful presentation and that roast is just mouth-watering! This. looks. beautiful! Great tip on having the butcher remove the bones then put them back on. 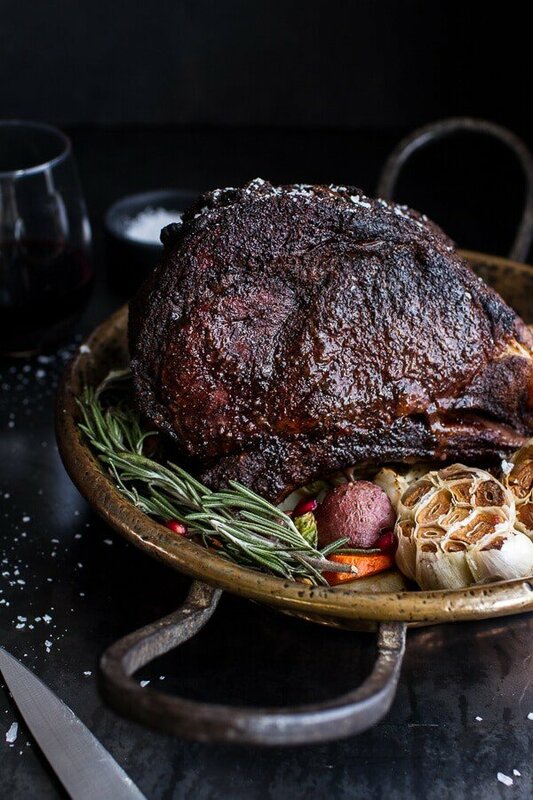 Oooh, my favorite cheeseburger recipe is coffee rubbed, and it totatlly doesn’t taste like coffee, just absolute yumminess…as this roast looks! 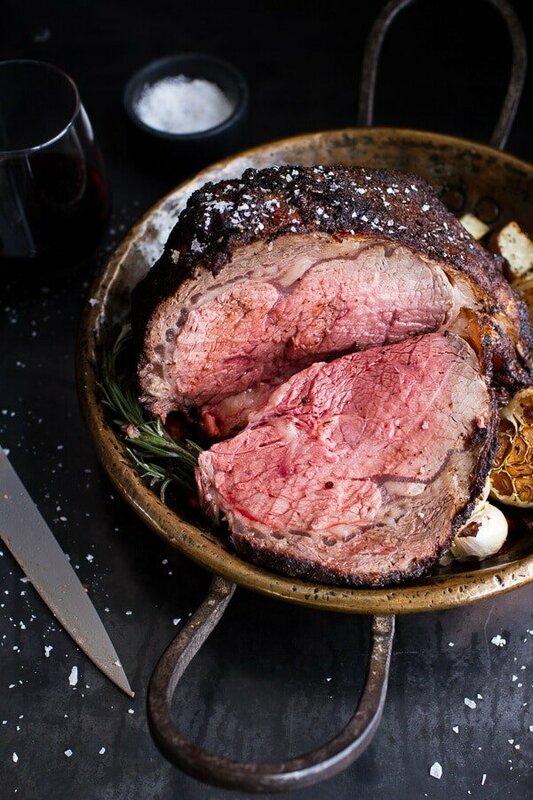 Love the roast, and that butter…drooling! Did you get the idea of tying the bone back on from Kenji at Serious Eats? I just read his recent informative post on prime rib and it sounds very similar. What kind of grind should I use for the coffee in the rub? Is it more coarse or fine, or did you pretty much use generic storebought coffee grounds? What are the sides you served with this? Everything on that plate looks absolutely delicious! Simply wonderful. The left over butter tastes amazing mixed into pasta too. How many million ways can I thank you for this recipe?!!! Made this last night (except no vanilla bean) and it’s by far the most tender, moist, perfect prime rib ever!! Going to check out more of your recipes.. I used Instant Folgers coffee granules..What kind did you use? SO excited you loved this!! THANKS!! what kind of coffee grounds did you use – instant or not, lavor, coarse, etc.? I used regular, ground coffee beans. Thanks! Any advice on adapting this for a slow cooker? Hi! I would just sear the meat and then add it to the slow cooker. Then just cook until your desired doneness. My guess is somewhere around 6 hours. Hope that helps! You are truly a gifted chef. I’ve made a bunch of your recipes and they’ve all been divine but this one, my dear, was heavenly. I made it for my husband and me (I bought two bones worth of the prime rib and it made several days of leftovers) and the beef melted in our mouths, the gorgonzola butter was rich and decadent, the roasted vegetables were caramelized perfectly and roasty sweet. The whole meal blew us away. Made it with buttermilk mashed potatoes and we both thought we had died and gone to heaven. I wanted to ask you what kind of roasting pan you used? I am making this over the weekend for our holiday/friend party and want to be sure it’s perfect! I am SO excited! Hi! Vegetarian here. 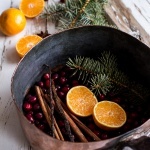 I’m hosting Christmas at my new home and am at a loss as to what to make for the main course. My whole family wants meat and well, this looks amazing. I’ve never made anything like this before. I’m not even sure how to buy it. Do I just ask for it at the counter? What does 3-4 rib mean? Can I double the recipe or should I then cook two separate hunks of meat instead of one bigger one? AH! Yes, just ask for the meat at the counter (the butcher should be able to help you and point you in the right direction). You can either double the recipe or make a larger roast, just adjust the cooking times as needed (google the amount of time per pound for your roast). 3-4 ribs is the amount of rib bones that are in the roast. Happy to help in anyway that I can, so let me know if you have other questions! 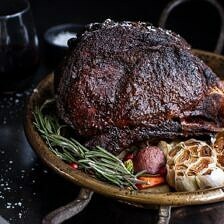 Another suggestion to try with prime rib to reduce the possibility of overcooking. Cook it sous vide at 135 degrees for 3-5 hours and just before serving, heat the oven up to broil and broil it for 10 – 15 minutes then cut and serve. The vegetables can also be cooked sous vide and added to the broiler for finishing with the prime rib. 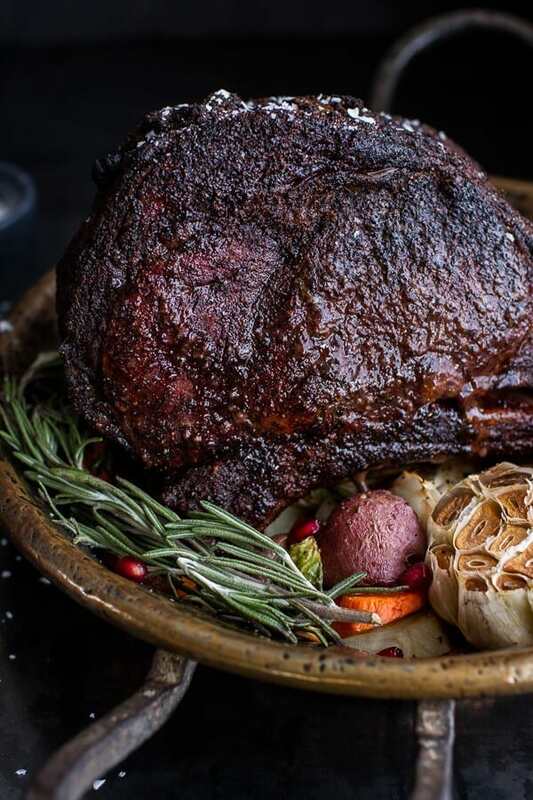 For an extra delight, cold smoke the prime rib and the vegetables for 4 hours about two days before cooking and tightly wrap them in plastic bags and refrigerate until the big day! What if i have a 7 rib roast how long will i bake it ? Hey Maria! To figure out the total cooking time, allow about 11-12 minutes per pound for rare and 13-15 minutes per pound for medium rare. A flatter roast will cook more quickly than a thicker one. I recommend using a meat thermometer to get the best cooked roast and to easily know when it is done. Let me know if you have other questions. Merry Christmas! 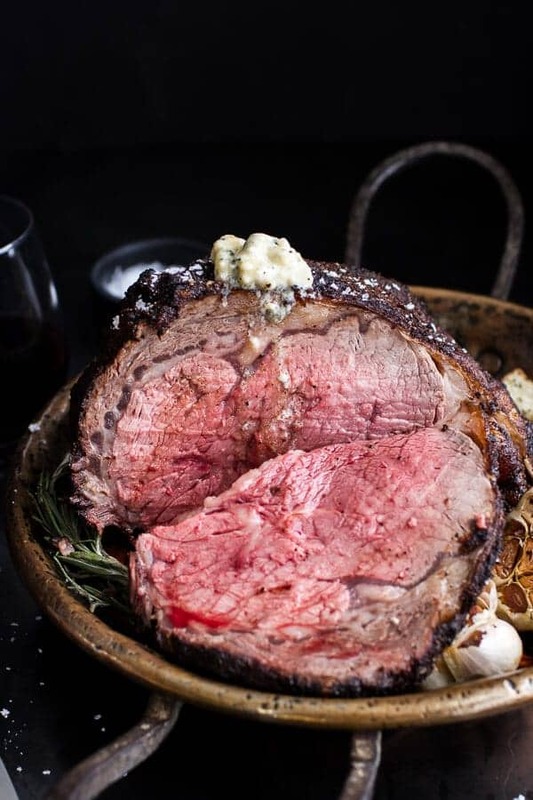 What is the name of the side you served with this (Coffee Rubbed Prime Rib Roast with Roasted Garlic Gorgonzola Butter). It looks like Brussels sprouts and maybe potatoes. It looks very colorful and yummy. HI! It is just the root vegetables I roasted the prime rib with. Brussels sprouts, potatoes and carrots. Let me know if you have questions. Hope you love this recipe! 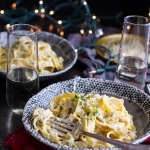 Hi there – I’ve made this recipe before and it was divine. You are truly gifted. The gorgonzola butter was so rich and interesting on top of the beef and everything turned out perfectly after following your instructions to a T. 😀 Another one of our faves! I am wondering how many servings you would suggest for this recipe. I remember having leftovers when I made it the first time but can’t remember how much I had left exactly. Any ideas? This looks delicious! I want to make this in the instant pot though… do you think you could weigh in on the how-to for that? In any case thank you for yet another awesome and interesting recipe! You’re the best! HI! I am sorry, I don’t feel comfortable giving those times as I really can’t guess. It will vary greatly depending on the size and I have never cooked a cut of meat like this in the instant pot. Sorry I could not help.